To have both a tasty and nourishing diet onboard is essential. We all know this bad feeling when after hours at the helm we rather suddenly realize that we haven´t been eating all day. And worse if not a drop of water has been drunk. Human bodies do loose power very fast and although sailing is not comparable to triathlon it´s of course an energy sapping sport. Not to mention that having something to eat during bad weather is of course a motivating thing and not for nothing is a ship´s cook considered second most important person after the skipper. I did have the opportunity to get a first experience of what it feels like to cook and eat a meal onboard an offshore going sailing yacht: During our cruise with the fast Pogo 40 Class 40 racer some two weeks ago. A yacht´s kitchen is called a galley. 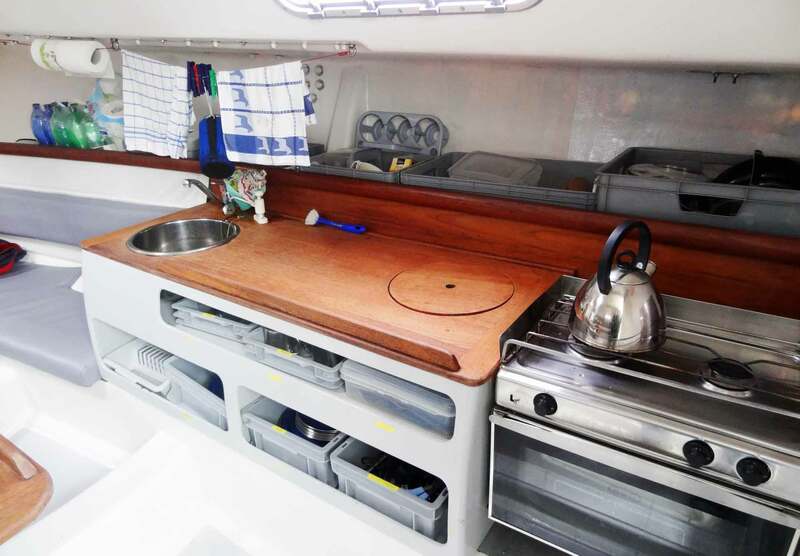 And unless you´re the chef onboard QE2 your yacht will feature a rather small galley as I found the one onboard our Pogo 40 was rather cramped too. But that will be no handicap because a narrow galley means short ways to go and as acting ship´s cook you should be in control of everything right within an arm´s range. What will differ a galley from your home´s kitchen the most will be the fact that this one is moving. And it can move abrupt! So having a safe stand is essential and Rule #1: Always have one hand for the ship, check yourself in the galley even in good weather as you won´t see any surprising waves coming! A galley´s stove in most cases will be run by gaseous fuels like Propane. So there´s always a lot of caution much needed because this fuel cannot just burn, it can form an explosive blend with oxygen and fires are amongst the most causes of fatal yacht losses. A yacht should have two valves controlling the gas: One directly at the gas cartridge-box (that should be well outside the yacht situated abaft or in the bow) and one directly at the stove itself. When I leave port, I do have the first one open for the whole cruise. The valve at the stove is only opened while cooking: Rule #2: Close the gas valve at the stove whenever the stove is not in use! 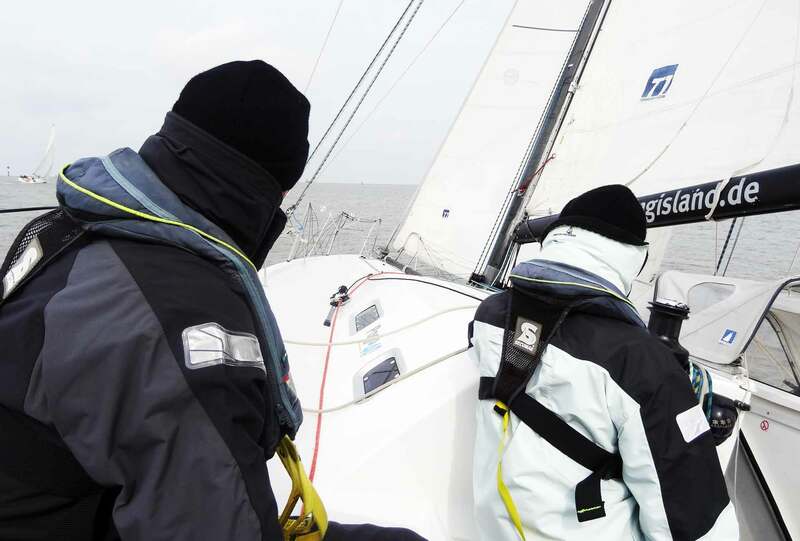 If you have guests on board the skipper´s safety briefing should incorporate proper utilization of the stove itself. Be aware: Gaseous fuels are heavier than air, will sink down to the saloon´s bottom and build up until … Boom. Cooking underway or mooring in Harbor? When we have been on our way back from the Island Helgoland to the German port of Cuxhafen the crew quickly felt hungry after some three hours into the trip. Our yacht did make speeds of up to 13 knots and although swell wasn´t that hard we did have a lot of motion in the ship. As the skipper was searching for a volunteer to heat up the galley I raised my arm and went down. I thought that this could be an interesting experience. Having chocked myself between sink and navigation table I first tried to make myself comfortable with our yacht´s movements. We have been sailing under Gennaker and that proved to add a lot of small but abrupt course changes to the ploughing of the ship. I was lucky that we´ve had decided to cook our vegetarian Sauce Bolognese whilst in harbor since I surely would have chopped off one or two fingers from my hand trying to prepare all these little carrots and onions. Rule #3: Try to foresee the next cruise legs and maybe prepare meals when it´s still easy to do so. 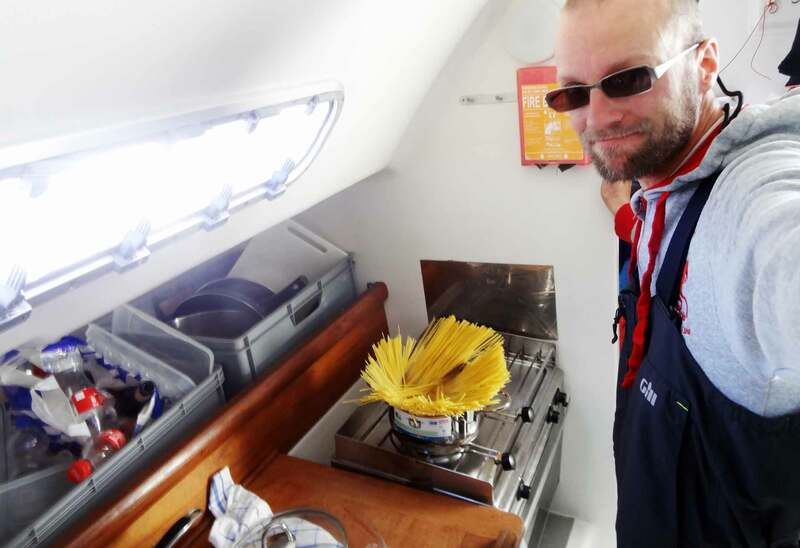 Onboard Cooking during heeled Sailing. So, having a pot of cold but tasty sauce I would just have to cook pasta and heat up the sauce again. Easy as ABC? Well, let´s call it interesting because cooking noodles for 5 hungry men is a huge task which I underestimated. I chose a pot rather two numbers too small for all the carbohydrates which would later cause some minor trouble in the galley. Rule #4: Always – no, always! – choose big pots even if you cook small portions. Because that will prevent the pot´s contents from spilling over. And spilling over could mean landing on the stove – which is okay since the worst that can happen is the flame to go out. But it can also spill over you – and having one kilogram of hot noodles cooking your belly and legs is awful. Having a good, hot Meal whilst sailing. Some 15 minutes after I went down to the galley everything was fine in the end. 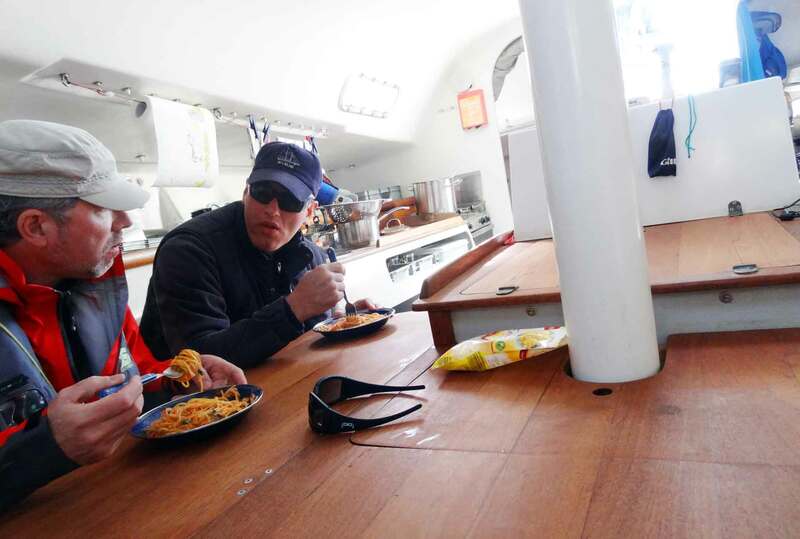 I mixed together pasta and sauce and shouted “Ready-ho for the meal!” Since two of us had to constantly man both rudder and the Gennaker sheet they did have to remain on station, skipper as well. So at we ate in shifts and I sat down at the large Pogo 40 table to have a huge mountain of yummy hot pasta. To have one´s stomach filled with a hot meal, an even hotter tea or coffee afterwards worked wonders in terms of capacity. As we entered deck and manned stations to have the other relieved we could sail the ship all the way into harbor without problems. Food will keep your body strong and warm, your spirits high and up and will replenish both body and soul. Rule #5: Don´t just pre-cook the stuff prior casting off but also have at hand small snacks like fresh apples which will be tasty, nuts or chocolate are good for one´s nerves or even bananas for quick energy. Don´t forget to prepare a large thermos jug of hot water for a freshly brewed cup of coffee or tea – this will keep you warm and awake. So I would say my first foray into the world of offshore-cooking has been from a culinary point of view quite okay but – most important – did teach me a lot of things and practical experiences which I will definitely find useful when casting off next time. Enjoy your meal, sailors. Next Post	Top Notch Performance Cruisers: X-Yachts of Haderslev.